“Edie crouched on her bedroom windowsill, training her field glasses on the three boys by the stone pond. Their names were Lyle, Jason and Tom, and she hated them. They were like foxes, thin and cunning, with eyes that flashed through mops of filthy hair. Edie’s grandmother has been put in a home and she’s been forced to move from her home in London to a farm with her three horrible cousins and an aunt who ignores their nasty ways. So when her mothers Cousin Charles turns up and offers to send her to a prestigious boarding school, she thinks things are looking up. However there are conditions to her entry into the school and they have been set by Charles, not the school itself. She is there to keep a watchful eye on Anastasia, the unhappy daughter of a Russian Prince and before long Edie will realise that she has entered into a world of sinister mystery and a kidnap plot. There were certain things I was expecting of this book and to be honest it surprised me in many ways. While I thought it was a historical story about an almost servent like girl befriending the daughter of a prince, it actually turned out to be a modern thriller with all the air of a classic boarding school story – the likes of which could easily be found within Edith Blyton’s collection. The story was good and I really enjoyed it. There were a lot of questions and a lot of twists and turns which made the sinister plot that Edie and Anastasia find themselves involved in even more sinister. I think it suits the wild imagination of the middle grade age range perfectly but the story may be a bit too simple for older or more advanced readers. If you ever wanted to find yourself whisked into the wild world of boarding school and it be a total living conspiracy than this book will be for you regardless of the obviousness regarding who the people behind the things going on were. The characters were a little bland and I thought that you didn’t find out much about them. I liked that Edie was so strong willed but disliked that she couldn’t stand up for herself when it came to the (granted very few) male characters in the book. I liked Anastasia though and felt truly sorry for what she was going through and how the girls at school were talking and gossiping about her so much. The women in charge at the school were interesting enough and I liked Miss Fotheringay, especially as you could never tell exactly what her angle was. The book was enjoyable and the writing worked well. I did enjoy it and liked a lot about it but I will admit it was a bit too drawn out with all the big reveals coming right at the end, I would have preferred things to be a bit more staggered. Like I said I really did get the classic boarding school story feel from this book and I think if you are a parent who wants their 9 year old to enjoy those stories like you did but they are put off Blyton because of how old fashioned they now seem, this would be a good one to pass on to them. According to a quick search on Amazon this book is the first of a series and I think it will work well if the pace is bumped up a little more in the later books – it definitely has got great potential and I will checking out any sequels there may be! 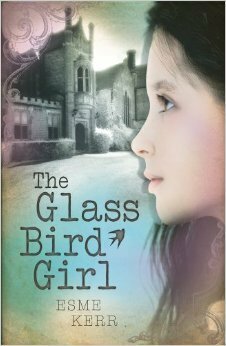 The Glass Bird Girl was published on May 1st by Chicken House Books. My copy was sent from the publisher in exchange for an honest review.